I've made a browser extension that allows user to subscribe to any kind of tags. Now available on Google Web Store! Just download the file and then drag and drop it inside the browser window and follow instructions. Nice! That's really useful, thank you! Brave is a chromium based browser (at least per my knowledge) but it throws a dropdown error saying that 'apps, extensions, and user scripts can't be added from this website'. Hmm, okay, interesting. Doesn't seem to be working, or at least it appears that way. We're making progress though so that's appreciated. The 'Watched' tab acts more like a link to 'Posts', just with the addition of /1/ at the url's end, and the subscribe buttons don't appear to do anything visible. Going back into the extensions section, it seems like an error of some sort was thrown. Fixed it, tested it on latest version of browser, seems working. Still have no idea why the same code was running perfectly on pure Chromium and refused to do so on Brave. Fixed it , tested it on latest version of browser, seems working. 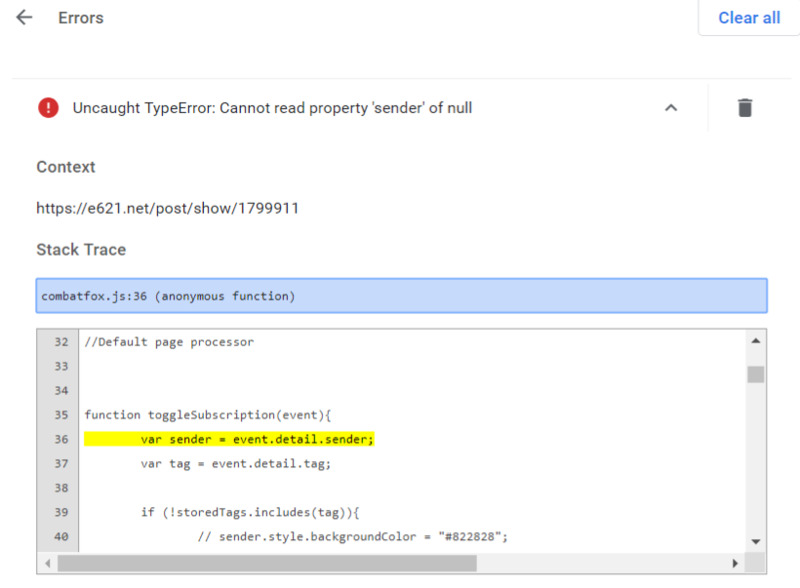 Still have no idea why the same code was running perfectly on pure Chromium and refused to do so on Brave. Uninstalled the old version and reinstalled the new version. Alright, starting to see function. Clicking on the icon changes OwO to XwX but it only does so for the top most tag (often the artist). After just leaving the artist tag as is and going to the 'Watched' tab, I'm redirected to a search with "~X " in the tag search with no relation to the selected tag, or the artist tag. Clicking the back button and force refreshing now shows all the icons as XwX and clicking on them only toggles the artist tag. No errors are being thrown in the extensions page. Clearing cookies shouldn't be a problem as I'm getting the same results in incognito mode . Well, which version of browser do you use? I installed latest from their site and can't reproduce it. The previous problem was related to determining which OwO button was clicked to change it's title, and it seems like fix didn't help. Still, it has to be able to maintain list of subscriptions, just can't refresh their titles. You can try checking it opening combatfox.js file in text editor and making line "DEBUG_LOGGING" look like "const DEBUG_LOGGING = true;". After reloading extension it will show the list of tags in the console after every button click. No need to clear cookies, they are not used. Dunno how it works, should we probably move to PM? Honestly, I don't know why it isn't a built-in functionality of e621 itself yet. Such an obvious thing to have, one would think. to true, I turned the extension off and back on, nothing appears to have changed and no errors are apparent. I think it would be a good idea to keep debugging public so that way other people who might be testing can see what's already been tried. Honestly, I don't know why it isn't a built-in functionality of e621 itself yet. Hey, since you have it installed (and presumably working), what browser are you using? Well, what's with new version? Well, what's with new version ? Aye, that's the version I previously tried, didn't work. Ahhhhh, that seems to have achieved a desired result. It would appear that the search engine doesn't mind using more than the usual 'member' allotment of six tags per query so that's nice for starters. I wonder if that would open up the potential for abuse of site features? Not expecting much as far as functionality goes since this is for all intents and purposes, v1. Future functionality I'd like to see is the extension in the sidebar, click that and have it drop down, and make it so the tag that is clicked on (or maybe even check mark multiple tags?) opens up another tab and the search results are shown. Furthermore, I think that separating artists, characters, and the likes from regular tags would also be a smart improvement. The Watched tab shows what you'd expect it to, nothing much comes to mind on how that can be improved aside from what I had already mentioned about the extension in the sidebar in the comments above. I don't want to be seen as asking too much so I'll just leave it at that for now. My only question is if it would show an alert that a new image has been uploaded using a tag on your watch list? I can see this being very helpful when it comes to following artists and characters in particular. Extension doesn't interact with site in any special way -- it just makes requests like users do, and merges their results with page contents, as if you were browsing with few tabs open. It'd be very cool if we could access the link of the tags we are watching just by clicking on them on the little pop-up. Because all work deserves to be rewarded I could give you some money for adding these fonctionalities just DM me. Thanks for the amazing tool ! > Added check for new posts in popup window. Once plugin icon is clicked, it checks if new posts is available and shows their amount in the window. An update just popped up, that the extension now wants access to data on all sites. What changed to warrant this permissions update? Fixed it, sorry. Now it is limited to e621.net. Permission is used to request data from popup script to check if there is any new posts. It is needed because popup is not directly related to e621.net from browser's point of view. Available on Chrome Web Store! I started using this to replace all my open tabs (tree tabs) and near the bottom of the list noticed that suddenly everything I had watched disappeared. Only a few tags were left on the list. There wouldn't happen to be a 'history' of sorts would there?